True chocolate Australian Labradoodles are actually quite rare because the majority of them fade to a café colour. The true chocolate colour is dark, rich and does not fade. They are born almost black in colour and maintain the rich dark colour throughout their lifetime. The colour should be even across the body, and the nose pigment should be rose. It can be difficult to predict whether or not chocolate puppies will fade, but as a rule of thumb the darker they are when born, the more likely they will hold their colour. 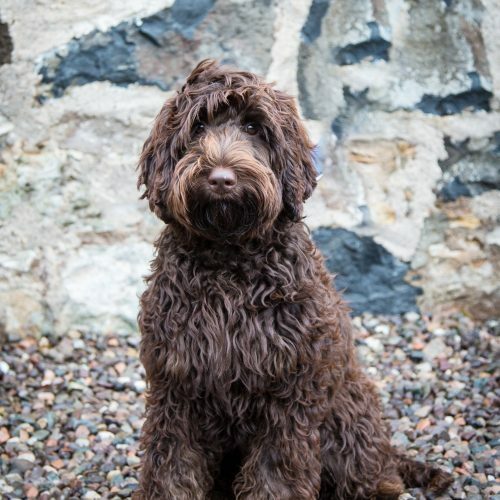 We have recently acquired a lovely true chocolate miniature Australian Labradoodle, Hudson, who carries the Rufus gene. This means that his coat will never fade and when bred to the right girl, his puppies will not fade either! We are fortunate to produce both miniature and medium sized chocolate Austalian Labradoodle puppies quite frequently. Please view our Available Puppies page to see what puppies we have available just now and in the coming months. Contact us to enquire about our next litter of Chocolate Australian Labradoodle puppies.